A second drawing of Axe, who’ll appear in Coronation Necklace, as drawn by Greg Mustache. She’ll likely be a lot bigger in her final design. 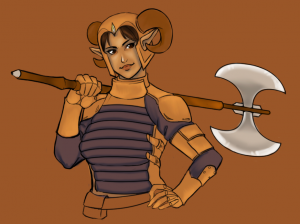 This entry was posted in art, Axe and tagged art, Axe by Eisah. Bookmark the permalink. I feel really lucky to have discovered your site and look forward to more fun posts here. Your info was extremely helpful for me. Big thumbs up for this website!